I have no idea why this book was sitting in my shelves – I probably bought it at some point – a long time ago. It’s short, only 57 pages long, but the language is very difficult – and it’s not always easy to just figure out what’s going on. Hrothgar, the lord of the Danes has built himself a hall to celebrate his victories and pay honor to his warriors. Beowulf of Geats is in attendance. But Grendel, a monster descendent of the Biblical Cain, hears the music and comes and attacks the hall and everyone in it. Beowulf slays Grendel and when Grendel’s mother seeks vengeance Beowulf slays her, too. After this he goes home a celebrated hero in victory. 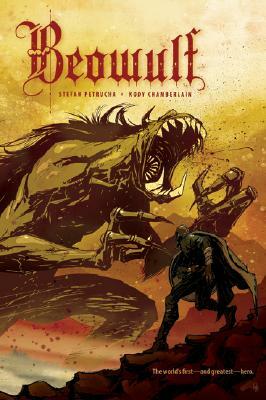 Years pass and battles are fought but one day a dragon comes to Geats – Beowulf slays the dragon but is fatally wounded. He is buried in a small hill where his followers come to pay homage and leave treasures. I think this book needs to be studied to get the full effect of the setting and language and culture which made heroes of dragon slayers – stuff like that. It was interesting but I don’t think I understood the subtleties.